Resveratrol is a type of natural phenol, a stillbenoid. Is a 3,5,4'-trihydroxy-trans-stilbene, found in grapes, red wine (it contain 0.1-14.3 mg/l of Resveratrol), purple grape juice, peanuts, and some berries. Resveratrol is a fat-soluble compound that occurs in a trans and a cis configuration. Its synthesis from p-coumaroyl CoA and malonyl CoA (these substrates are present in all plants but most plants do not contain the enzyme, resveratrol synthase, necessary for the biosynthesis of the polyphenolic stilbene structure of resveratrol) is induced by stress, injury, infection or UV-irradiation, and it is classified as a phytoalexin anti-fungicide conferring disease resistance in the plant kingdom. The first mention of Resveratrol was in a Japanese article in 1939 by Michio Takaoka, who isolated it from the poisonous, but medicinal, Veratrum album, variety grandiflorum. Its name probably comes from the fact that is a resorcinol derivative coming from a Veratrum species. In the last years, some scientists find the importance of Resveratrol as a inhibitor in development of cancer and extend lifespan. Resveratrol is found in red grapes and in other fruits. Red wine contains more Resveratrol than white wine because red wine is fermented with the skins.The amount of resveratrol in grape skins varies with the grape cultivar, its geographic origin, and exposure to fungal infection. The predominant form of resveratrol in grapes and grape juice is trans-resveratrol glucoside. One of the most promising sources is peanuts, especially sprouted peanuts where the content rivals that in grapes. Before sprouting, it was in the range of 2.3 to 4.5 μg/g, and after sprouting, in the range of 11.7 to 25.7 μg/g depending upon peanut cultivar. Cocoa powder, baking chocolate, and dark chocolate also have low levels of resveratrol in normal consumption quantities (0.35 to 1.85 mg/kg). 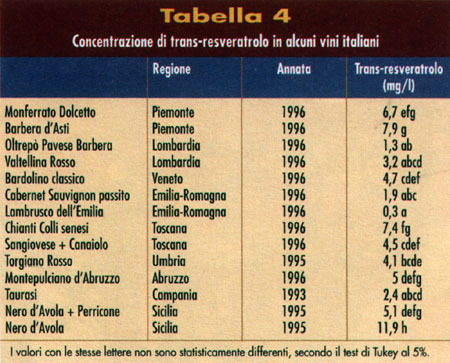 The trans-resveratrol concentration in 40 Tuscan wines ranged from 0.3 to 2.1 mg/l in the 32 red wines tested and had a maximum of 0.1 mg/l in the 8 white wines in the test (both the cis- and trans-isomers) They ranged from 0.5 mg/l to 1.9 mg/l in red wines and had a maximum of 0.2 mg/l in white wines. In a review of published resveratrol concentrations, the average in red wines is 1.9 ± 1.7 mg trans-resveratrol/L (8.2 ± 7.5 μM), ranging from nondetectable levels to 14.3 mg/l (62.7 μM) trans-resveratrol. Some reports suggest some aspect of the wine making process converts piceid to resveratrol in wine, as wine seems to have twice the average resveratrol concentration of the equivalent commercial juices. Resveratrol could help prevent cancer by decreasing exposure to these activated carcinogens, as a inhibitor of the expression and activity of certain cytochrome P450 enzymes. Resveratrol has been found to increase the expression and activity of the phase II enzyme NADH:quinone reductase in cultured cells. Resveratrol has been found to induce cell cycle arrest when added to cancer cells grown in culture, preserving the normal cells cycle regulation. Resveratrol has been found to inhibit proliferation and induce apoptosis in a number of cancer cell lines. Resveratrol has been found to inhibit the activity of at least one type of matrix metalloproteinase. and also can inhibit the angiogenesis (the rapid growth of tumoral cells) in vitro. Resveratrol has been found to inhibit the activity of several inflammatory enzymes in vitro, including cyclooxygenase and lipoxygenase. In the absence of other risk factors (e.g. diabetes, hypertension, hyperhomocysteinemia, hypercholesterolemia), advanced age itself significantly increases cardiovascular morbidity by enhancing vascular oxidative stress and inflammation. Cardiovascular aging is characterized by a gradual deterioration of endothelial function and myocardial performance both in experimental animals and in humans. Recent studies suggest that Resveratrol and its nutritional intake may contribute to the “French paradox”, the unexpectedly low cardiovascular morbidity in the Mediterranean population. Epidemiological studies have linked moderate intake of resveratrol-containing red wine with a significant decrease in the risk of coronary artery disease (it might be a key ingredient in red wine that helps prevent damage to blood vessels, reduces "bad" cholesterol and prevents blood clots). is an evidence that platelets have an important role in atherogenesis. In clinical practice, aspirin is usefull to reduce the odds of serious atherothrombotic vascular events and death in high risk patients; in some cases, aspirin is useless. In recent studies is increasing evidence that resveratrol suppresses platelet aggregation in humans and it has been suggested that this action may be responsible for its protection against coronary heart disease. Resveratrol was shown to inhibit cyclooxygenase-1, which likely contributes to its aspirin-like effects. Recent studies revealed that resveratrol effectively inhibits aggregation of platelets from patients with aspirin resistance. Resveratrol effectively neutralizes free radicals and other oxidants and inhibits low density lipoprotein (LDL) oxidation. Upon oral consumption of resveratrol, circulating and intracellular levels of resveratrol in humans are likely to be much lower than that of other important antioxidants, such as vitamin C, uric acid, vitamin E, and glutathione. Resveratrol is a powerful antioxidant, more effective also of flavonoid, because it acts primarily "upstream" of the reaction, making it inactive copper as catalyst, in fact it is a chelating ion copper Cu2+. A recent study has demonstrated that intravenous administration of resveratrol attenuates the deleterious effects of ischemia/reperfusion (it increased leucocyte adherence,vascular transmigration in the mesenteric microcirculation). It is significant that resveratrol was shown in vitro to decrease endothelial VCAM and ICAM-1 expression and attenuate monocyte adhesiveness to the endothelium; iot also can regulate the expression of inflammatory mediators, such as adhesion molecules, cytokines (e.g. TNFα, IL-1β, IL-6), and iNOS. Resveratrol is also known for the inhibition of NF-kB (its activation induce the transcription of a large range of genes implicated in inflammation, including cytokines such as TNFα, IL-6 and IL-1β, chemokines and adhesion molecules; it is also implicated to predispose arteries to atherosclerosis). Resveratrol was also shown to down-regulate iNOS in other cell types (an up-regulation of iNOS is thought to play a central role in vascular oxidative stress, endothelial dysfunction and pro-atherogenic processes). Resveratrol may also inhibit a second pro-inflammatory transcription factor, AP-1 (activator protein 1, as NF-κB, is important in the regulation of many inflammatory genes that are induced by oxidative stress and its inhibition may contribute to the anti-inflammatory properties of Resveratrol). Resveratrol was reported to Increase lifespan in simple eukaryotes (_S. cerevisiae, C. elegans, D. melanogaster_) and has been suggested as a potential calorie restriction mimetic. A study laboratory shown that Resveratrol is sirtuin activator (is NAD+-dependent histone deacetylases that increases life span in C.Elegans); despite its absolute requirement for NAD+, the regulation of sirtuins by NAD+ biosynthesis pathways is poorly understood in mammals. High intakes of Resveratrol could increase the risk of bleeding in combianation with anticoagulant drugs, such as warfarin (Coumadin); antiplatelet drugs; and non-steroidal anti-inflammatory drugs, including aspirin, ibuprofen and others. Resveratrol has been reported to inhibit the activity of cytochrome P450 3A4 (CYP3A4) in vitro. This interaction has not been reported in humans, but high intakes of resveratrol could increase the toxicity of drugs that undergo first-pass metabolism by CYP3A4. Drugs known to be metabolized by CYP3A4 include: HMG-CoA reductase inhibitors (e.g. lovastatin), calcium channel antagonists (e.g. felodipine, nifedipine), anti-arrhythmic agents (e.g. amiodarone), HIV protease inhibitors (e.g. saquinivir), immunosuppressants (e.g. cyclosporine and tacrolimus), antihistamines, benzodiazepines (e.g. midazolam and triazolam), and drugs used to treat erectile dysfunction (e.g. sildenafil). Resveratrol is important for inhibit the proliferation of some human cancer cell lines, including those from breast, prostate, stomach, colon, pancreatic, and thyroid cancers. Oral resveratrol was not effective in inhibiting the development of lung cancer induced by carcinogens in cigarette smoke; resveratrol (1 mg/kg orally) reduced the number and size of the esophageal tumors in rats treated with a carcinogen. Resveratrol shows that is usefull in some brain disease, such as Alzheimer's disease and other neurodegenerative diseases (it reduced plaque formation in animal brains). In humans, oral doses of resveratrol may reduce B-amyloid plaque associated with aging changes in the brain. Resveratrol exerts its actions modulating the estrogens response systems (they are involved in male reproductive biology). This actions is visible in adult male rats (Male Sprague-Dawley rats). The effects of a long-term therapy with Resveratrol are not known. A research shows that it may stimulate the growth of human breast cancer cells, possibly because of resveratrol's chemical structure, which is similar to a phytoestrogen. Resveratrol in common with other polyphenols, was found to be a strong topoisomerase inhibitor, sharing similarities to chemotherapeutic anticancer drugs, such as etoposide and doxorubicin. Despite of the conventional treatments (statins) with antioxidant and/or anti-inflammatory, in the last years the use of Resveratrol is improved in extend lifespan in experimental aging models. We hope that, in the future, Resveratrol research will yield novel therapeutic approaches usefull for the benefit of elderly patients.